The celeriac at the allotment is far from ready; having been sown a few weeks ago, it is only just emerging from the seed compost. Nonetheless its a day for a soup today, and I bought a celeriac the other day; reduced to a matter of a few pence due to a rather unnecessary best before date. Celeriac teams brilliantly with blue cheese, and as if planned, I have a bit of Danish Blue cheese in the back of the fridge. I like to make use of all we have in the fridge and take great pleasure from managing to combine leftover bits into something delicious. 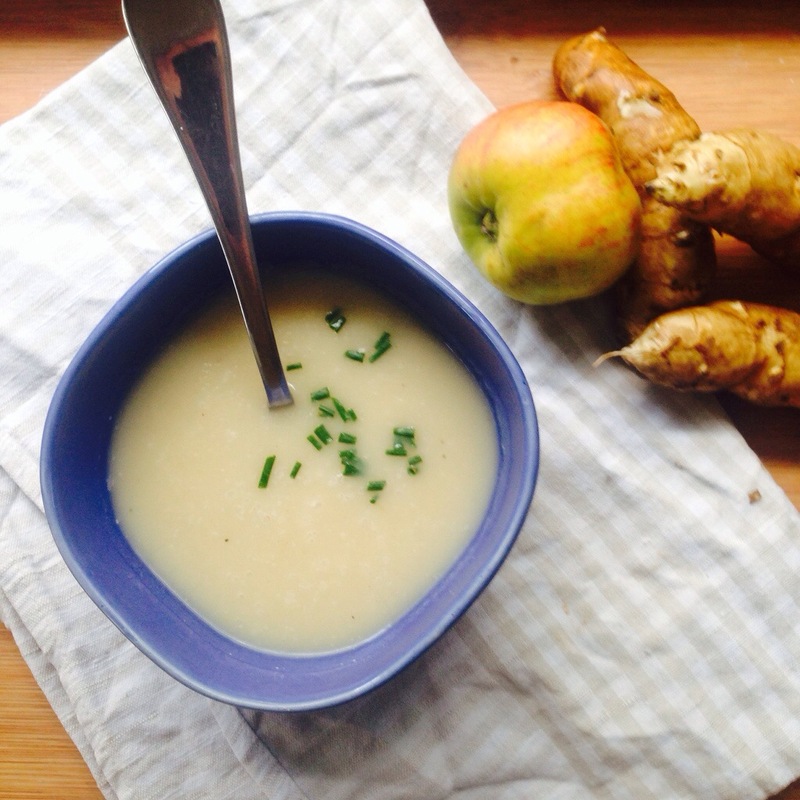 The celeriac and blue cheese combine to produce a really smooth soup, but to complete the dish it needs something with contrasting texture. 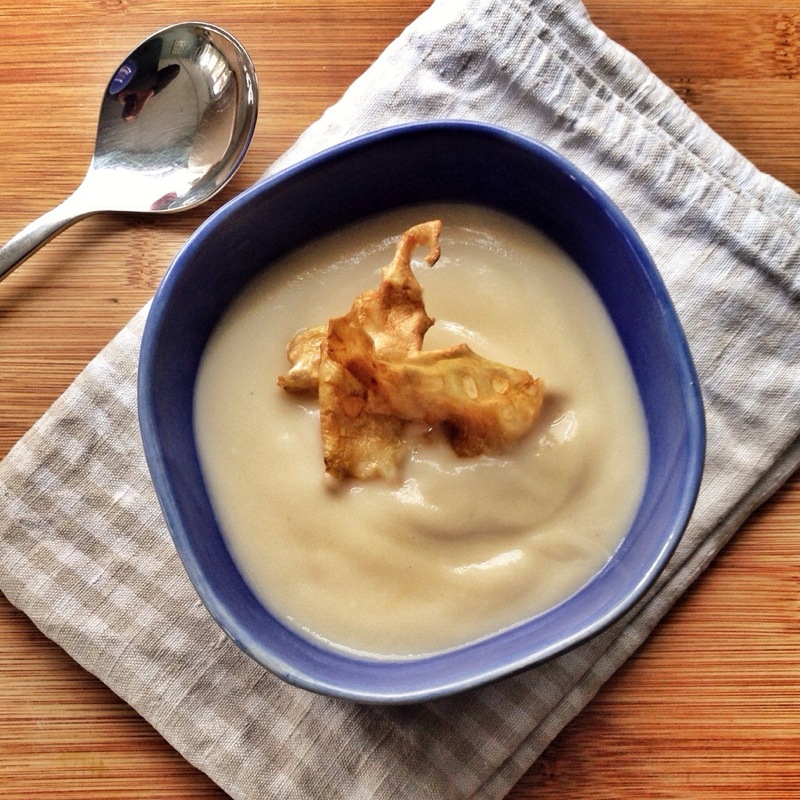 For a long while I’ve been interested in the idea of making vegetable crisps, so I experimented with celeriac crisps as a crispy garnish for the soup. It works well, continuing the flavour, but adding a different texture to the dish. Slowly sweat the onion and garlic until softened and translucent. Meanwhile, peel the celeriac. Use a peeler to peel enough ‘crisps’ from the celeriac, before cutting the remaining root into dice. Put the peeled ‘crisps’ to one side and add the diced celeriac to the onions and garlic. Cook for a few minutes (you don’t want too much colour on the vegetables), then add the stock and simmer for 20 minutes or so, or until celeriac is tender. When the celeriac is soft, pour the contents of the saucepan into the food processor or liquidiser and blitz til smooth. Add the blue cheese and whizz a little more, before reheating. To make the crisp garnish, heat oil to a depth of 2cm and when the oil is at a hot enough temperature add the saved celeriac peelings. Cook for a few minutes until the celeriac starts to turn a little golden, before removing and placing on kitchen paper to absorb the excess oil. 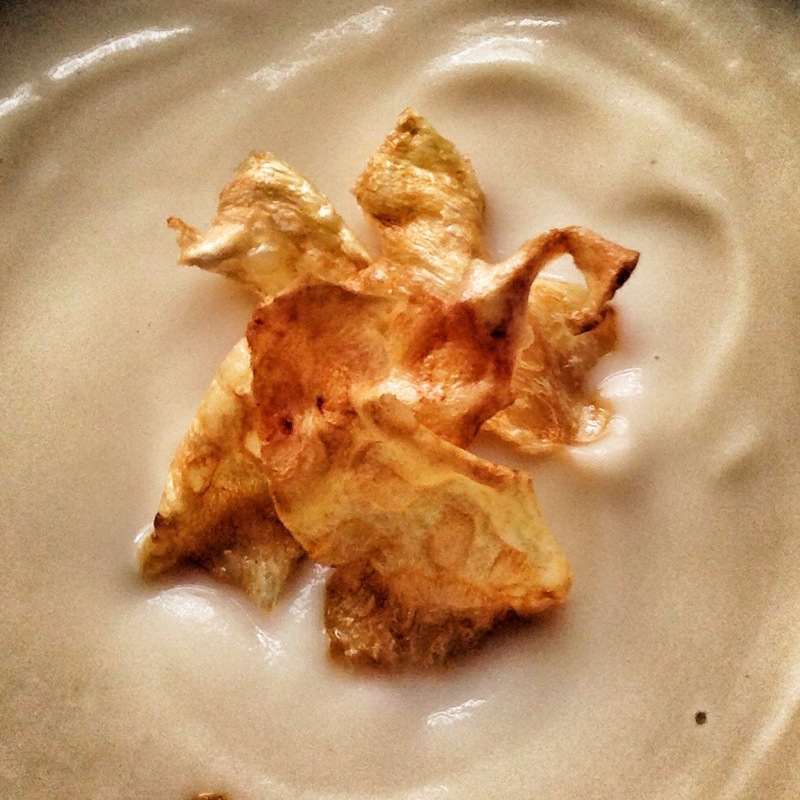 To serve, pour into bowls and place the crisps in the middle of the soup, a twist of black pepper wouldn’t go a miss. I came across this soup on a trip to Amsterdam; where we had it at as a starter at a great little restaurant serving modern Dutch food. I ordered it, as I’m a big fan of mustard and was curious to see how a mustard soup would taste, especially as it was garnished with crayfish. The combination of the piquant mustard and the sweet little pieces of crayfish was a revelation. 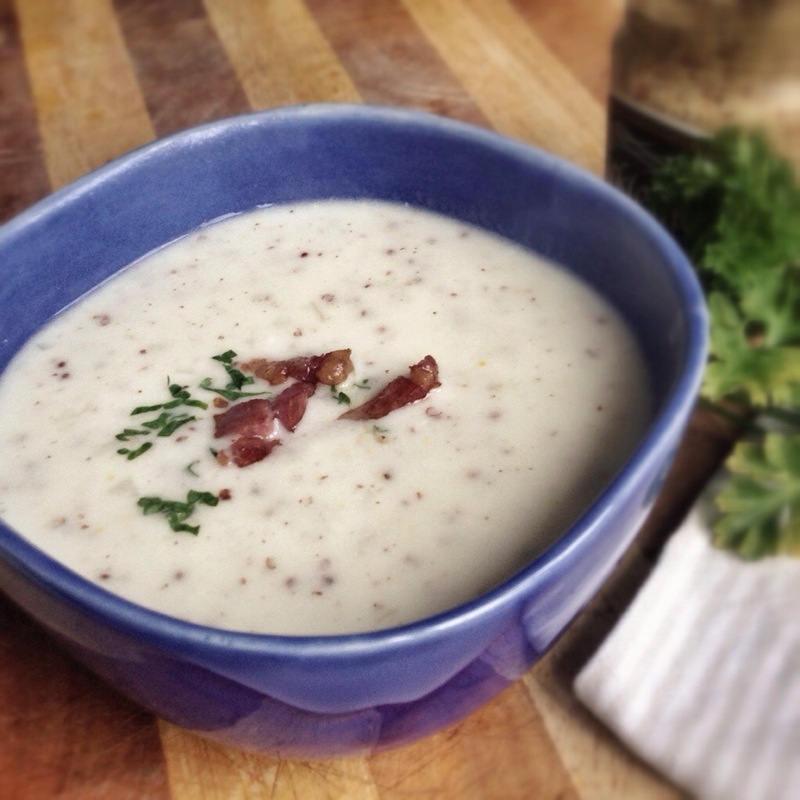 It’s been a while, but having been given some fantastic beer wholegrain mustard for Christmas, I finally got round to creating my own version of this soup the other day. No crayfish, but the salty bacon compliments the soup well and (it seems) is a traditional garnish. Melt the butter and gently sweat the onions until they are soft and translucent. Combine the crème fraiche, cream cheese and mustard. Add the stock to the onions and bring to the boil, before whisking in the mustard mix until smooth, then simmer for a few minutes. Add the cornflour mix, stir, and allow the soup to thicken Serve the soup with a sprinkle of crispy bacon bits and a bit of chopped parsley. Christmas in our house is all about Christmas Day, although I must admit I enjoy the leftovers of the turkey as much as (or probably even more than) the main roast. However, across the world the main Christmas celebration meal is often had on the evening before. Wigilia, literally meaning “vigil,” is the main focus of Polish Christmas and is a meatless Christmas Eve meal, also known as the Star Supper, as it doesn’t begin until the first star appears in the sky. 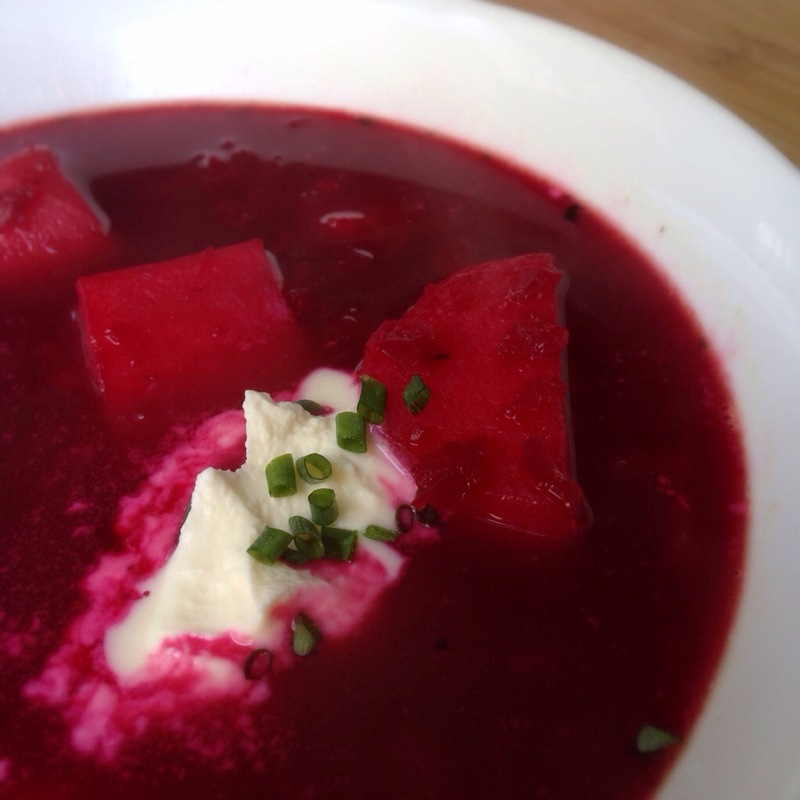 One of the traditional elements of this meal is a soup called barszcz; the Polish version of the Russian beetroot soup, borscht. We have quite a bit of beetroot at the allotment; I love the earthy taste and vibrant colour, which seems to offer some brightness in the cold, dark winter. 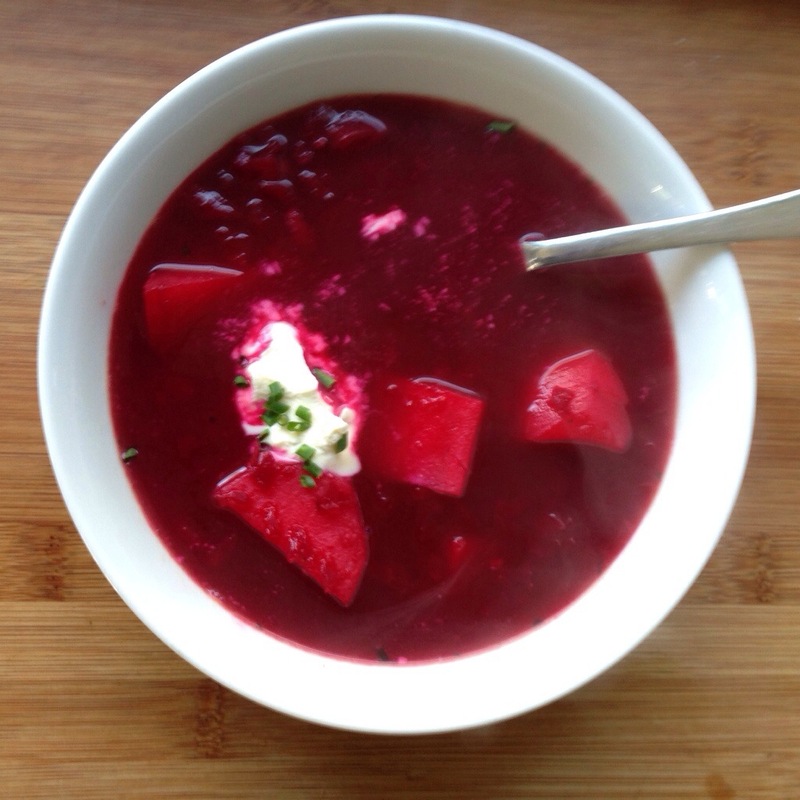 There are different versions of this soup, but mine is a clear soup with finely chopped beet, served with boiled potatoes and sour cream. The sour cream element is both authentically Polish, and simultaneously unauthentic as the sour cream I use is Lithuanian. Apparently Polish sour cream is superior to that usually found in our supermarkets, having a deeper flavour and thicker consistency. We have a local Eastern European store run by Lithuanians, so I went to find some Polish sour cream. On asking, the shop assistant agreed that Polish sour cream was indeed good, but insisted that Lithuanian was even better! I have to say that the sour cream I left the shop with was amazing; creamy, yet still sour and refreshing, a brilliant accompaniment to the earthy flavours of the soup. Preheat the oven to 200°C, wrap the washed beets in aluminum foil and roast until tender (about 30-45 minutes). When they’re cool enough to handle, peel and slice into strips or finely chop. In a medium saucepan, bring the stock to the boil, add chopped beetroot, garlic, sugar, lemon juice and salt and pepper to taste. Simmer for about ten minutes, allowing the flavours to combine. 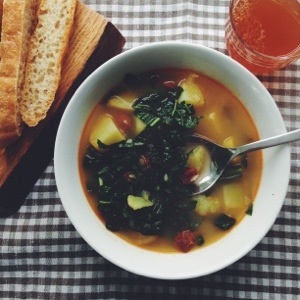 Serve hot with the boiled potatoes and a spoonful of the sour cream.